Abstract— Computer network course is a subject that is the basic course that must be mastered by students majoring in Informatics Engineering. Practical and interesting learning has an interesting role in the learning process. Exciting learning can improve student learning outcomes and help students improve their understanding, as well as increase their motivation to improve their learning outcomes and knowledge. This article will discuss the problems related to computer network courses that are teaching methods and learning media. Based on the objectives of computer network courses it is proposed to optimize the content in teaching as well as on instructional media proposed to adopt software simulation for teaching to be interesting. F. Shrouf, J. Ordieres, And G. Miragliotta, “Smart Factories In Industry 4.0: A Review Of The Concept And Of Energy Management Approached In Production Based On The Internet Of Things Paradigm,” Ieee Int. Conf. Ind. Eng. Eng. Manag., Vol. 2015–Janua, Pp. 697–701, 2014. M. Crnjac And N. Banduka, “From Concept To The Introduction Of Industry 4 . 0,” Vol. 8, No. 1, Pp. 21–30, 2017. S. S. Brodjonegoro, “Kecakapan Era 4.0,” Vol. 0, Pp. 1–2, 2018. E. Di Gropello, A. Kruse, And P. Tandon, Skills For The Labor Market In Indonesia. 2011. D. Jendral, K. Riset, And P. Tinggi, “Kerangka Kualifikasi Nasional Indonesia Dokumen 001,” Pp. 1–9, 2015. Republik Indonesia, “Standard National Pendidikan Tinggi,” Peratur. Menteri Pendidik. Dan Kebud. Republik Indones., p. 31, 2014. P. H. M. Gurgel, L. H. C. Branco, E. F. Barbosa, And K. R. L. J. C. Branco, “Development Of a Practical Computer Network Course Through Netkit Virtualization Tool,” Procedia Comput. Sci., Vol. 18, Pp. 2583–2586, 2013. M. F. Aburdene, X. Meng, And G. L. Mokodean, “Analysis Of Computer Networks Courses In Undergraduate Computer Science , Electrical Engineering And Information Science Programs,” 2004. T. P. K. Dikti, “Tim Pengembang Kurikulum Dikti,” Tim Pengembang Kurikulum Dikti, 2012. R. A. Reaux, R. W. Ehrich, F. Mccreary, K. Rowland, And S. Hood, “Pcs For Families: A Study Of Early Intervention Using Networked Computing In Education,” J. Educ. Comput. Res., Vol. 19, No. 4, Pp. 383–410, 1998. P. M. Papadopoulos, T. D. Lagkas, And S. N. Demetriadis, “How To Improve The Peer Review Method: Free-Selection Vs Assigned-Pair Protocol Evaluated In a Computer Networking Course,” Comput. Educ., Vol. 59, No. 2, Pp. 182–195, 2012. D. Duvivier, G. Quesnel, And E. Ramat, “Virtual Laboratory Environment Conclusion – Perspectives,” Vol. 53, No. 2, Pp. 216–222, 2010. M. Montero And D. R. Manzano, “Design And Deployment Of Hands-On Network Lab Experiments For Computer Science Engineers *,” Vol. 33, No. 2, Pp. 855–864, 2017. P. Segeč, M. Kubina, And P. Palúch, “Viro – The Online Tool For The Networking Education,” Procedia - Soc. Behav. Sci., Vol. 174, Pp. 3788–3796, 2015. N. M. M. Noor, N. Yayao, And S. Sulaiman, “Effectiveness Of Using Cisco Packet Tracer As a Learning Tool: A Case Study Of Routing Protocol,” Int. J. Inf. Educ. Technol., Vol. 8, No. 1, Pp. 11–16, 2018. M. Gusev, S. Ristov, And A. Donevski, “Integrating Practical Cisco Ccna Courses In The Computer Networks’ Curriculum,” Ieee Glob. Eng. Educ. Conf. Educon, No. April, Pp. 499–506, 2014. L. Evans, “The Effectiveness Of Using Virtual Laboratories To Teach Computer Networking Skills In Zambia,” J. Chem. Inf. Model., Vol. 53, No. 9, Pp. 1689–1699, 2013. P. Gil, F. A. Candelas, And C. A. Jara, “Computer Networks E-Learning Based On Interactive Simulations And Scorm,” Int. J. Online Eng., Vol. 7, No. 2, Pp. 15–23, 2011. E. Z. Red, “Students’ Performance And Satisfaction With The Cisco Academy Networking Program (Computer Networking 1): Basis For a Proposed Pedagogical Action In Blended Learning,” Int. J. Multidiscip. Res., Vol. 2, No. September, Pp. 183–198, 2012. M. Beheshti And A. Pakfar, “Using Intelligent Educational Technology In Computer Network,” Procedia - Soc. Behav. Sci., Vol. 116, Pp. 2994–2997, 2014. H. a Lahoud And J. P. Krichen, “Networking Labs In The Online Environment : Indicators For Success,” J. Technol. Stud., Vol. 36, No. 2, Pp. 31–40, 2010. E. G. Bradley And B. Kendall, “A Review Of Computer Simulations In Teacher Education,” J. Educ. Technol. Syst., Vol. 43, No. 1, Pp. 3–12, 2014. T. M. Sanguino, “Wifisim: An Educational Tool For The Study And Design Of Wireless Networks,” Ieee Trans. Educ., Vol. 56, No. 2, Pp. 149–155, 2013. N. Spyropoulou, G. Demopoulou, C. Pierrakeas, I. Koutsonikos, And A. Kameas, “Developing a Computer Programming Mooc,” Procedia Comput. Sci., Vol. 65, No. Iccmit, Pp. 182–191, 2015. H. Wang, “Development And Implementation Of Engineering Materials And Thermal Processing Network Course Based On Autonomous Learning,” Procedia Eng., Vol. 15, Pp. 127–131, 2011. H. Igor, J. Bohuslava, J. Martin, And N. Martin, “Application Of Neural Networks In Computer Security,” Procedia Eng., Vol. 69, Pp. 1209–1215, 2014. F. Ö. K. Bakioğlu, E. Kartal, Z. Özen, Ç. S. Erol, And S. Gülseçen, “Aspects Of Students About Information Technology Courses In Social Science,” Procedia - Soc. Behav. Sci., Vol. 176, Pp. 148–154, 2015. L. Xu, D. Huang, And W. Tsai, “V-Lab: a Cloud-Based Virtual Laboratory Platform For Hands-On Networking Courses,” Proc. 2012 Acm Conf. Innov. Technol. Comput. Sci. Educ., Pp. 256–261, 2012. G. Jones, “Academic Use Of Commercial Network Simulation Tools,” Int. J. Electr. Eng. Educ., Vol. 37, No. 2, Pp. 136–145, 2000. W. R. Franta, “A Generalized Simulator For Computer Networks,” Pp. 123–132. H. Ueda And M. Nakamura, “Data Analysis For Evaluation On Course Design And Improvement Of ‘Cyberethics’ Moodle Online Courses,” Procedia Comput. Sci., Vol. 112, Pp. 2345–2353, 2017. C. Etus, “An Overview Of Network Simulation Tools In Teaching Computer Network,” Vol. 2, No. 11, Pp. 479–485, 2015. N. Jalinus, R. A. Nabawi, And A. Mardin, “The Seven Steps Of Project Based Learning Model To Enhance Productive Competences Of Vocational Students,” Vol. 102, No. Ictvt, Pp. 251–256, 2017. W. Y. Hwang, C. Kongcharoen, And G. Ghinea, “To Enhance Collaborative Learning And Practice Network Knowledge With a Virtualization Laboratory And Online Synchronous Discussion,” Int. Rev. Res. Open Distance Learn., Vol. 15, No. 4, Pp. 113–137, 2014. B. Cameron, “The Effectiveness Of Simulation In a Hybrid And Online Networking Course,” Techtrends, Vol. 47, No. 5, Pp. 18–21, 2003. D. P. Mahesi Agni Zaus, Rizky Ema Wulansari, Syaiful Islami, “Perancangan Media Pembelajaran Listrik Statis Dan Dinamis Berbasis Android,” Vol. 1, No. 1, Pp. 1–7, 2018. N. S. Foundation Et Al., “In,” No. 14. Z. Ran, “Exploration On The Key Issues Of Practical Teaching Reform Of Computer Network,” Energy Procedia, Vol. 17, Pp. 1914–1919, 2012. D. Pernanda, M. A. Zaus, R. E. Wulansari, And S. Islami, “Effectiveness Of Instructional Media Based On Interactive Cd Learning On Basic Network At Vocational High School : Improving Student Cognitive Ability Effectiveness Of Instructional Media Based On Interactive Cd Learning On Basic Network At Vocational Hig,” Int. Conf. Educ. Soc. Sci. Technol., No. February, 2018. 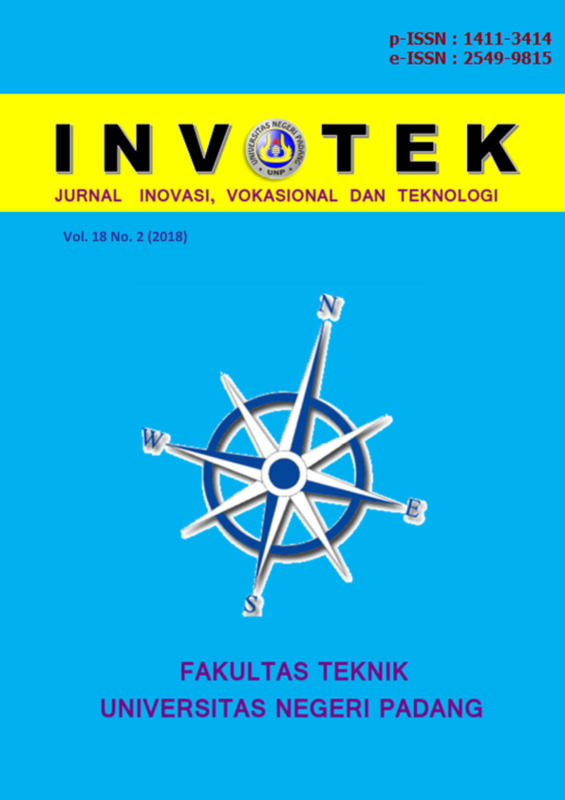 A. Yulastri, H. Hidayat, Ganefri, S. Islami, And F. Edya, “Developing An Entrepreneurship Module By Using Product-Based Learning Approach In Vocational Education,” Int. J. Environ. Sci. Educ., Vol. 12, No. 5, Pp. 1097–1109, 2017. H. Effendi, “Peningkatan Hasil Belajar Siswa Menggunakan Software Ekts Pada Mata Pelajaran Pengendali Elektromagnetik.Pdf.” . D. Fatmadilla, Usmeldi, And Krismadinata, “Penerapan Strategi Training Within Industry Dalam Pembelajaran Mengoperasikan Sistem Pengendali Elektromagnetik.Pdf.” 2017. M. L. Hamzah And A. A. Purwati, “Sistem Manajemen Inventori Komputer Menggunakan Near Field Communication Berbasis Android (Studi Kasus Di Stie Pelita Indonesia Pekanbaru) Computer,” J. Econ. Bus. Account., Vol. 1, No. 1, Pp. 95–104, 2017.